A couple weeks in to October and I haven't gotten as much done on the Osiron as I probably should - Deadline is bearing down on us! That said, there was a little forward progress and I got the force blade greened up and ready for detailing. 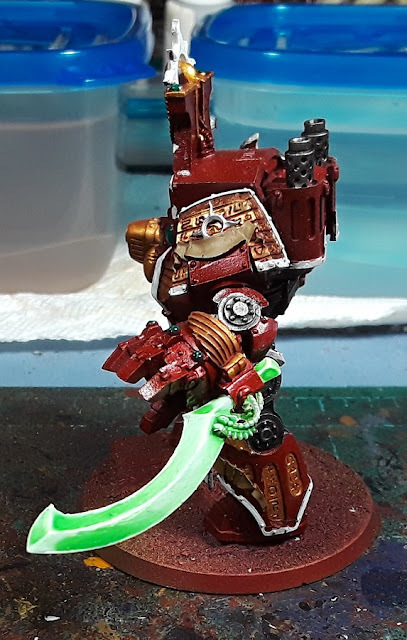 Don't forget to check out http://dreadtober.blogspot.com/ for more dread-y goodness! Laid in a couple more colors as well, but nothing worth documenting. I will say that painting this guy has been challenging, I really have army fatigue with the Thousand Sons, and the Sons of Horus have been way more exciting to paint. A whole mess of pics of the boys in green coming soon!